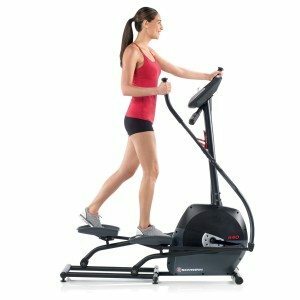 Is a stepper the same as an elliptical machine? Well it has the lower mechanism of an elliptical machine, and if you can’t afford a full sized model then Sunny Health & Fitness have a full range of stepper models, ranging from the mini stepper to the twister Stepper. They are all highly praised, with some seriously positive reviews from over thousands of buyers on Amazon, and they represent excellent value for money. 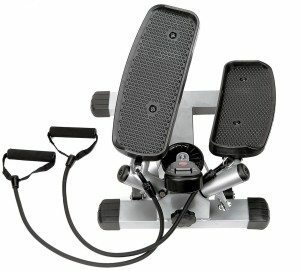 An elliptical trainer worth its salt has comfortable foot pedals & Sunny has provided that with it’s remarkable steppers. For your comfort, large foot pedals are provided to fit a wide gamut of foot sizes. They also have slip resistant rubber which keeps your feet planted firmly throughout your workout. So is there any more to it than just the foot pedals? Yes, this stepper is basically a portable elliptical machine and as such it also has an on-board computer. The LCD display shows your total step count, time, the calories burned and the rep count. So How Does The Twister Stepper Work? A Sunny step machine moves up and down and the SF1115 model has a twist action which is powered by your thighs, hamstrings, buttocks and calf muscles. By stepping and twisting you will tone up all these lower leg muscles and also work the obliques (love handles) at the sides of your abdomen. Just like a standard full sized elliptical you can vary the resistance levels for more intensity. And just like on a full sized machine, the level of impact is minimal on your joints. Another bonus of the stepper is that it is compact. It measures 18.5in L x 16in W x 8in H. You can get a great workout without compromising your living space. Sunny also bill this product “the folding climbing stepper”. Some versions have a handlebar as well so if you don’t fancy getting the step only model the choice is yours. The max weight of the Sunny Twister Stepper without the handlebars (P8000 model & SF115 model) is 220 pounds. The dual-action swivel stepper also has a 220 pound limit as does the handlebar version. Some models have a 250 weight limit so just check the details before you buy if you are above 220 pounds. Saying that they are really robust and made with heavy duty steel, and the build quality contributes to the almost 5* ratings the full range of Sunny steppers get on Amazon. Does It Work The Upper Body? It depends what version you buy. 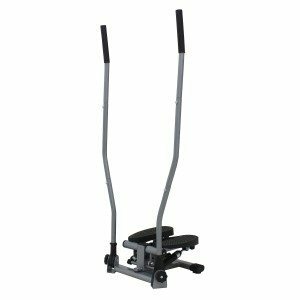 The aforementioned dual-action swivel stepper works the upper body for sure and the standard stepper & twister stepper have built in resistant bands attached to it that work the upper body. 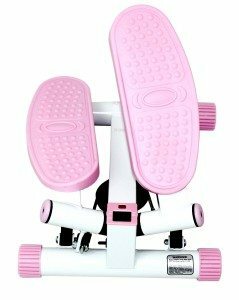 You can purchase the model also in pink and without resistance bands. Does The Sunny Twister Stepper Have Any Drawbacks? You can only use the stepper for 15 minutes at a time as this is the max time limit for continuous use. If you use if for longer the hydraulics can over heat. If they overheat they can get damaged and they will start to make an irregular noise. There are lubrication instructions with the manual that are simple to apply that will help keep your machine from overheating. Although according to Sunny’s customer service, the machine can handle close to an hour of continuous use. The 15 minute time limit is a precaution to prolong the life of your machine. With adequate lubrication you should be able to use yours for 30-45 minutes each day with no problems. One of the benefits of an elliptical is that you can get a full workout done in a short period of time, plus all the evidence suggests that short high intensity and interval style workouts are more beneficial for losing weight, and more importantly for your heart health. Even if you have a full sized elliptical or treadmill you will appreciate just being able to pull this out in your kitchen, or take to a friends house or on a business trip or vacation. Storage will never be an issue. If you don’t need the full range of features a full size elliptical has but you still like the principles behind one, now you can get a lot of the same benefits with one of these steppers. For years, Sole Fitness elliptical machines have been setting the standard for being affordable, flexible and durable compared to other brands that are currently available in today’s marketplace. It is the brand that the Hilton hotel group uses exclusively. That is a huge endorsement since the best quality is offered by these hotels. These machines might not offer an impressive range of features, however if you are looking for a solid workout, without breaking your budget, then you don’t have to look any further than this fine exercise machine. The E25 is the entry level machine in the Sole E Class. On the opposite end of the price scale is the Sole E95, however that award winning model will cost you an additional $1,500 unless there is a special offer on it. 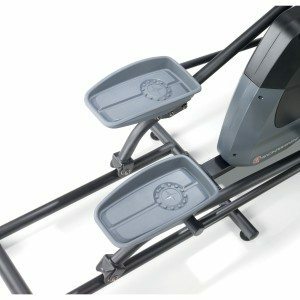 The E25 has established its reputation for delivering a thorough lower and upper body workout compared to the treadmill, which in general works the lower body only in addition to cardio. The E25 cost just under $1,000. The machine is fun to use and features a dashboard that comes with an easy-to-read display, is brightly lit and easy to navigate. This entry level elliptical machine really sets the standard for all other ellipticals to try and follow. It features solid design standards, is built using strong components, and comes with sufficient gear ratios to offer a challenging workout. A stationary handle bar set is also featured on the machine, including pulse sensors for monitoring your heart rate. If you like to listen to music as you are working out, any Mp3 player can be hooked up directly to your elliptical, which makes it very easy to work out while listening to your favorite music or audio program. It’s also very clear to see that Sole ellipticals have plenty of thought put into taking user comfort into consideration when designing the E class. As an example, the E25 comes with oversized foot pedals so that much less stress is placed on the knees. The inward slope that is part of the design is also gentler on the ankles. It comes with a very quiet drive system, so that you can stayed focused on your workout without becoming too distracted with that terrible clunking sound that is found in poorly built ellipticals. The machine also offers a 20-inch stride. It helps taller users be able to find a free flowing, evenly paced stride, making it an ideal option for those with long legs or up to 6 feet 7 inches tall. Compared to other Sole elliptical machines, this specific elliptical model has been built with a smaller and more compact frame – although a large flywheel is used to provide the user with an inertia feeling when their workout is really picking up the momentum. In addition, the heavy flywheel helps with stabilizing the machine since extra weight is added. There are 16 different ECB resistance levels to choose from, in addition to 30 different incline degrees for customizing precisely how hard you want a specific climb to be. Some of this machine’s best features include how efficient it is as well as that it easily fits into compact, small spaces for fast storage. For its price, it also offers excellent value. There are pulse sensors on the machine for monitoring your heart rate. In addition, there is also a heart rate chest strap for those who want to have more accurate figures. A built in cooling fan is also includes that helps to keep you cool during strenuous workouts. The warranty that the Sole Fitness E25 provides includes 1 year for labor and 3 years for parts in the event anything should go wrong with this elliptical machine. That is better than a majority of the one-year standard across the board warranties that is offer by most other elliptical machine manufacturers. 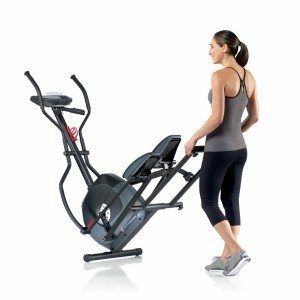 In other reviews of the Sole E25 elliptical, this specific machine has been considered to be the standard that all other elliptical models are based on – and it appears that this is true. The broad range of features offered by this model makes it easy to keep returning to it for comparison purposes. Its front drive is one of the features that this specific machine has that is debated. Some users of elliptical machines prefer having a rear drive system since it has a tendency to operate on a more smoother level. Front drive systems have a tendency to wobble when the user’s weight travel across the machine’s front end. This issue has been addressed by Sole, by equipping the back of this machine with two heavy rails and increase the remainder of the frame’s diameter. A heavy flywheel is also utilized by the machine to help stabilize it and to keep the parts turning very fluidly. It also prevents the machine from having a “steppy” like feeling the way the old stairmasters felt and helps to keep the foot pedals going in a circular motion. One of the things that is included with the E25 that not a lot of other elliptical machines come with is its power incline. This, combined with the extra weight capacity of 350 pounds that this machine offers, gives it an edge compared to many other machines in its same category- and particularly in its price range. In addition the machine is made from 38mm diameter toughened steel. Who Should Think About Buying This Workout Machine? When considering what your ideal workout is, one of the most important things to factor in, is precisely how you will be achieving your results- and also if you will really enjoy doing it. If you do, you are a lot more likely to continue with your workouts. The machine is very enjoyable. It is sturdy, smooth and the varying high gear ratios that it comes with provides an excellent workout. There are audio speakers as well so for motivation you’ll be able to listen to music. Ideally you should think about buying the Sole E25 if you’re searching for a complete workout. This machine will provide you with great lower and upper body workouts at an excellent value. At it $1,000 price point, you won’t need a gym members, and will be able to achieve the results you are looking for at home. The additional stride space offered by the Sole E25 makes it a great machine for taller individuals. With addition room for moving, the machine provides a workout that is more fluid compared to some of the other available models being offered in today’s marketplace. The Sole E25 elliptical machine is an excellent buy for its priced. With a cost of under $1,000, the machine is durable and stable, without being too expensive, especially for a home workout machine that might not always be used every day. It also is great to look at, and will comfortably fit into any room since it is just 30 inches tall and 67 inches wide. The Sole E25 in the past received numerous complaint from customers about it jumping track because of the fact that the rails are different widths. To their credit, this problem appears to have been fixed by Sole. The rails are the same width apart now. The Epic A30E is within the same price, but we don’t think it is as quiet or smooth as the Sole is. Sole is well known for offering high quality workout equipment. The company has a great reputation and provides first-rate customer service- if you ever happen to have a concern or tun into a problem. Some rear drivers might be thrown off by the front drive. However we didn’t find that it was a problem. Some owners report that it can rock a bit when it is close to its maximum weight. There was previously a problem in a few units that has been fixed now, with a bushing that was inside the pedals that was making an annoying squeaking noise. However, it wasn’t something that affected performance. A replacement bushing can be offered by Sole customer service. You need to be careful not to over lubricate the pedals since they are known to pop out sometimes. Fortunately, the Sole customer service representatives do have instructions for how this issue can be fixed if you do end up applying an excessive amount of lubricant. 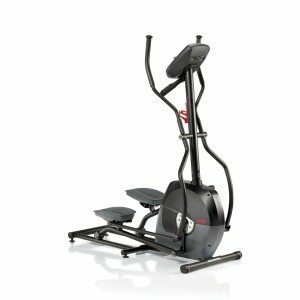 Schwinn A40 Elliptical Machine Review – Best Low Budget Elliptical? The A40 is Schwinn’s attempt at producing a budget elliptical trainer that has got quite a number of  features to make it challenging and great value for money. Is this a wise investment or would you be better of parting your money with another choice? Read on to find out. On the A40 you get 8 resistance levels courtesy of the near silent magnetic ECB system. 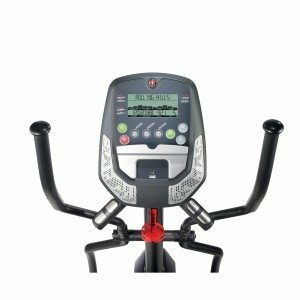 This same technology is used across the entire Schwinn elliptical range and it is highly regarded by anyone who has ever used a gym quality elliptical machine. You will find ECB systems on all professional elliptical models. It is comparable to using gears on a bike – some are easy and are for coasting along a flat road, and some are harder and force you to get up off the saddle and dig deep. A treadmill uses speed and an incline ramp to make the workout harder. An elliptical machine uses resistance and a ramp to make the workouts more challenging. The difference being is that ECB system applies a break to the flywheel. This does not cause high impact pressure on your body. it just makes the workout more tough without stressing your joints or tendons. Hence the reason an elliptical is touted to below impact on your body, in other words it provides a kind workout. The stride length it tops out at 17 inches which is adequate for individuals of average height. Schwinn have models with a 20 inch stride that will suit taller individuals but you need to pay more money for the privilege. There are 6 workout programs that come pre-installed with this machine this is enough you going and if you feel you haven’t not got enough you can always run the machine in manual mode. You can check the following stats on the multi function LCD screen; revolutions per minute (RPM), the distance travelled, your heartbeat bpm reading, what speed you are going, the resistance level you are currently using and how many calories you have used in the workout. There are contact heart rate sensor built into the console that measure your heart rate. You only get one set of handlebars with the machine they are the moving type. This will enable you to work your upper body as well as your lower body. Moving handles allow your back and your shoulders to get involved this means your legs and also your upper body gets a complete workout with this machine. If you are weighing this up against a treadmill, you need to look at value for money. A treadmill works mainly the lower body, and your cardiovascular system of course. If there is a treadmill in the same price bracket or cheaper, ask yourself whether you want a full body workout or one that provides a total workout. To stop the machine from rocking oversized stabilizers and levelers are built into the machine to add weight and support to the base of the unit. In reviews customers are constantly referring to how stable the machine feels. The recommended heaviest weight for an individual to safely use this machine is 275 pounds. That’s because the machine only weighs 90 pounds. The bonus of it being so light is that it is not that hard to move around. The console is battery powered. The advantage is you can use this in a power cut or take it outside without having to trail extension cables all over the place. Great for summer training or hot climes. Keep cool with the built in fan. There is space for a water bottle and there is also a reading rack for those you like to use their elliptical for reading pleasure instead of a frenetic workout. Transport wheels help you to move the machine around with ease. This compact elliptical measures a sprightly 59 inches in length and is 22.5 inches Wide. It measures 64 inches in Height. It’s good if you have low ceilings. 2 years is provide to cover the frame, parts and electronics are covered for 6 months and there is a 30 day warranty on “wear parts”. No feedback stats are displayed, so at the end of the workout you can’t chart your overall workout or save them to a usb to transfer to your computer or upload to an online fitness tracker. If you aren’t that professional about charting your workout progress this won’t bother you. If you are you’ll need to consider the 430 or 470 by Schwinn or look at another brand. The warranty is extremely short, 2 years for instance is a bit of an unusual time stamp to cover the frame. Most frames come with a lifetime or 10 year warranty. Is there something Schwinn have not been forthcoming about? 6 months is short for parts and electronics, but for Schwinn to sell this at such a low price for an elliptical there has to be a trade off somewhere and it’s the warranty length that gets it.